Mahinda Rajapaksa, to his credit, has not exactly claimed sole credit for the victory, although he more than anyone else arguably has the bragging rights, as all powerful Executive President and as Commander in Chief of the Armed Forces. But who was the true hero, then? An email doing the rounds these days of over-enthusiasm, braggadocio, fantasizing and vilification, speaks of a forgotten individual that brings perspective to this entire and ugly spectacle: the unnamed, faceless soldier who died to make it possible for two men and their supporters to argue over who did what and where and when and how and to whom. What of the Ranaviruva today, I wonder. What of the tens of thousands who perished to defend the Motherland, to ride the country of the menace called terrorism, to ensure that bombs would not explode, that fathers and mothers would not have to worry if they’ll ever see their children again when leave home? Who did they die for? What did they die for? We are told that they died (apart from what was mentioned above) to protect the territorial integrity of the country, to keep intact our sovereignty, to prevent the division of the country and preserve our freedoms. The true victor, the true deserver of credit is no more. So when we assess what the dead achieved or helped achieve with death we have to view the reality they left behind and the reality that politics may bring about. 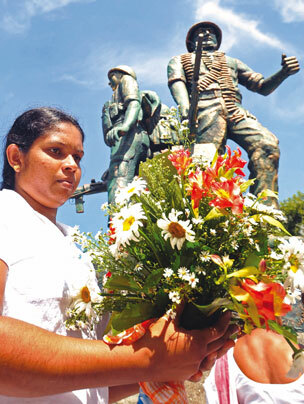 I am thinking about our Ranaviruva to whom we all owe so much. I am wondering what kind of thoughts would go through their afterlife-minds if they were to cast gaze on the land they died to protect. Let us suppose that Sarath Fonseka contrary to all opinion polls wins the election. We would have a President who has pledge to re-merge the North and East. We would have a President who has given a new lease of life to the Eelam Project now honour-bound to deliver on promise, the kappam or ‘pound of flesh’ for having helped him become President. Our Ranaviruva would find that the proxies of the terrorists who killed him have secured through Fonseka what Prabhakaran could not achieve with guns. He would find that Fonseka the politician has undone everything that Fonseka the soldier claims to have achieved for the Motherland. He would find to his horror that the Eelam myth and the notion of an exclusive Tamil homeland have been legislated into fact by Fonseka the politician. The Ranaviruva cannot be faulted if he turned around and asked Fonseka ‘What was that long drawn out war about, General?’ I think he would say something like this to Fonseka, after saluting him of course. ‘Sir, with all due respect, could you tell me why you made me fight and die to secure something that you now want to give back to what’s left of the LTTE? Could you tell me, General, why you got me killed if you really believed that these two provinces actually belonged to Tamils and no one else? Sir, if that was the case, why did we fight in the first place? ‘Sir, did you really believe when you ordered us to march into the arms of possible death that the North and East should be re-merged? Were you upset Sir when Chief Justice Sarath N Silva determined that the merger was unconstitutional? Sir, could you tell me what the JVP is telling now about the North and East, mergers, de-mergers and re-mergers and what kind of expressions are in the faces of Sarath N Silva, Tilvin and Somawansa when such issues are discussed? I almost forgot Sir, and please don’t think I am being cheeky, but tell me if your tongue is in your cheek?